Palastra-Holm Nature Preserve features fragile and unique habitats and is considered a “sanctuary” by the Conservancy. 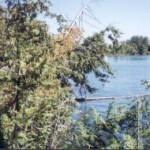 This property is largely a Hardwood-Conifer Swamp and includes 1500 feet on Elk Lake’s southwestern shore. The property also includes small areas of spruce plantation and pasture land. The swamp provides habitat for many unique plants and animals. The flora at Palastra-Holm Preserve is considered to be of statewide natural significance and contributes to the biodiversity of Michigan. Common trees in the swamp include black ash, eastern hemlock, birch, balsam fir, basswood, and the dominant northern white-cedar. 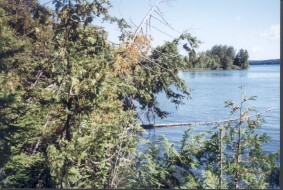 The swamp also helps water quality by slowing runoff and filtering pollutants and sediment before water enters Elk Lake. The shoreline is another important feature of the preserve. It is a transition area from the lake’s open water to the swamp. These transition ecosystems typically provide a very high density of species diversity and provides cover and forage for wide variety of aquatic life. The preserve’s shoreline is a mix of overhanging northern white-cedar trees on elevated mounds surrounded by inlets and thin zones of sand with goldenrods and sedges. Although the preserve is open to the public, its sensitive features are not suited to disturbance so there is no parking area or trail. The Boundary Map may help visitors stay on preserve property. This preserve can be observed from kayak but accessing land could be hazardous and is not recommended. In its continual effort to balance public access and use with protecting conservation land GTRLC strives to match properties with appropriate activities. Due to the preserve’s limited access, small size, proximity to occupied dwellings, and sensitivity of the wetlands hunting is not allowed.